Since the Northern Tablelands ride last October I have had the RossKKo flask sitting in pride of place on my bookshelf. It was to be passed on to one other forum member at the Karuah River Rally but due to circumstances beyond my control nothing happened so it will be passed on to a fresh member at the Snowy Ride after it has been refilled with some of the finest Bourbon. We shall need to have a discussion as to how this is kept track of etc. Zer Tourenfeurer (Rickmiester) of the Snowy Ride now has possession of the RossKKo Flask. May RossKKo ride with you and keep the waterproof gear handy. Last seen here getting a Honey Bourbon refill on it's way to Maitland. "To that end I would like to do our reporting of this upcoming gathering and future remembrances of the man, I'm sure there will be many, in the other thread on this forum called "Let Rosskko ride with you" and close this thread to further posts, but leave it as a sticky where it is currently located for members to be able to refer to in the future. Maybe the "Let Rosskko ride with you" thread could become a sticky as well in the Australian Rides and Meetings section. I'd like to support his suggestion. I didn't have as much contact with RossKKo as some here, but what I had was strong and valued, my experience mirroring the respect I saw in the Krew who were in regular contact with him before I bought my K and joined the forum. Reading the posts about the Bathurst gathering, I am continually sad that I have a prior commitment at that time. I'll be with you in spirit. @RT wrote: Last seen here getting a Honey Bourbon refill on it's way to Maitland. It's now in the hands of the Tourenfeurer Rickmeister and should be at the gathering at Bathurst to be passed on to the next willing member to do some more touring on a K. Well it doesn't have to be a K Rickmeister has a almost brand spanking R1200RT and RossKKo had some Suzuiks so as long as it is aboard a bike. Better report this. Last meet up at Jindabyne I managed to extract $55 from various members and donated it to GIST. Have a good day fellas. I'm out. Family and work commitments. Well 12 apostles assembled on the mount today to remember our riding mate. Here are some photos. Klompy placing the plaque on the concrete base that Waz had prepared earlier. Shots of drink to celebrate the occasion....from Lego BRICK shot glasses. We did discuss the possibilities of all being pulled over by the police for a random breath test....12 sitting next to one another in the police station. A great day for a great bloke. Hey guys had Mrs Waz on the phone worried abt him as he hasn t checked in. Anyone have any ideas of his where abouts at all?? Found in Eugowra. Everyone relax. cheers. 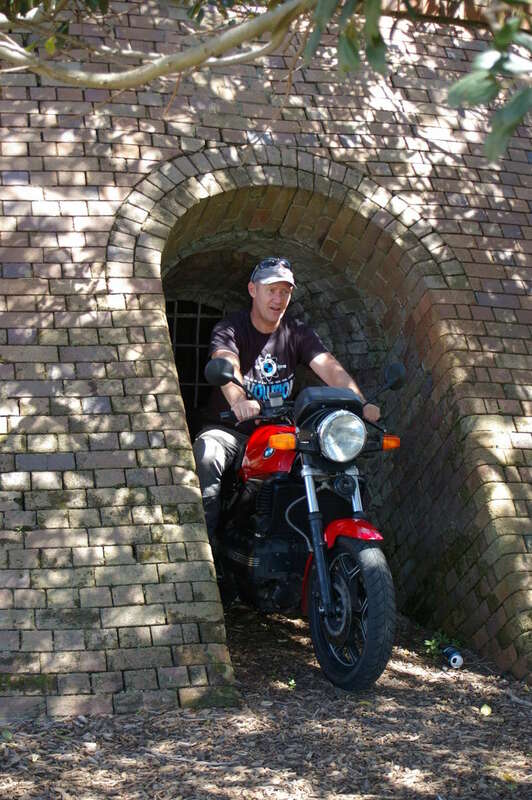 RossKKo at Sydney Park 08/12/2013 on his K100/2. May 26th 2017 dawned cool and clear in the Hunter Valley. Forum members from our local area and points north were preparing to head for Bathurst for a very special gathering. I busied myself getting my gear loaded onto the K75 and by 9:00am was ready to go. 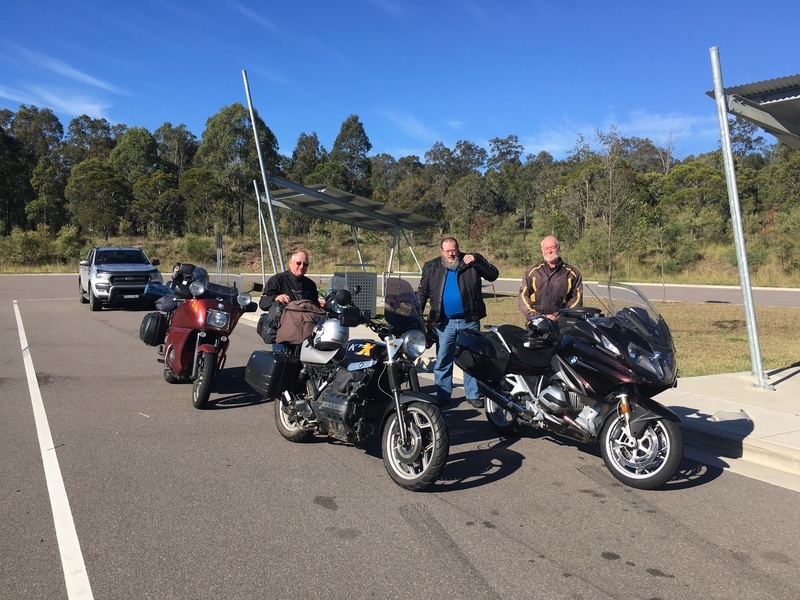 A short while later at the nearby Branxton roadside rest area I was joined by the Grabau brothers Rickmeister and Tom and Rick G who had ridden down to Newcastle from Stanthorpe in Queensland on Thursday, at my guess about 650km, as a warm up for the weekend. The plan was to meet Smithy near Denman, about an hour's ride west of my place, at around 11:00am. He had needed to be on the road at 6:00am to make the rendezvous and I'm sure the temperature up his way would definitely have been below zero. My companions had been alerted by an overhead highway sign to a road closure up ahead due to an accident but we headed off on our planned route anyway hoping it would be clear by the time we got there. We were lucky in being on the right side of the closure signs and were able to make the meeting point on time. I consulted my phone to see where Smithy might be as we had arranged to send each other a Glympse so first arrivals could monitor the other person's position. In surprise I saw that he was about 15 minutes up the road ahead of us and became stationary as I watched. A quick call confirmed that he had been able to divert around the road closure from his end. So we were off to catch up and press on to the Bylong shop for a warming coffee. 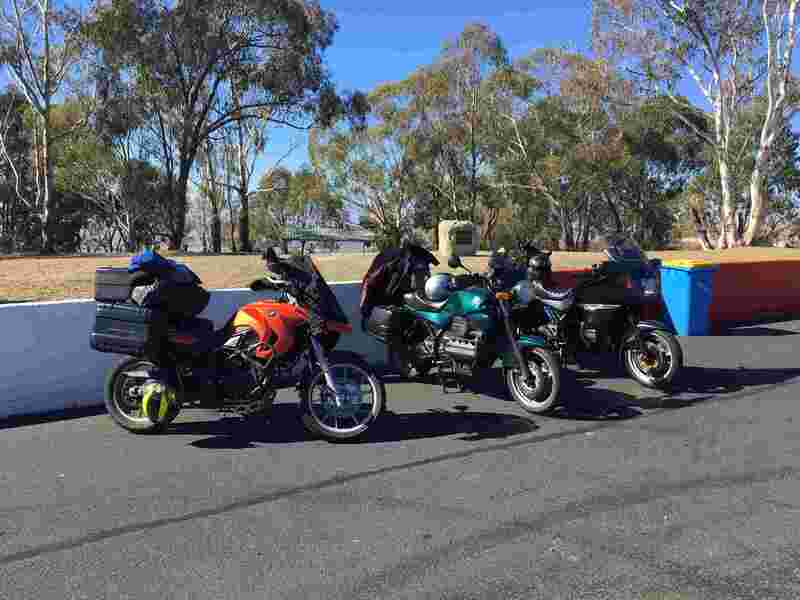 Suitably refreshed the five of us rode on to Rylstone for fuel and a pie for lunch - next stop Bathurst. 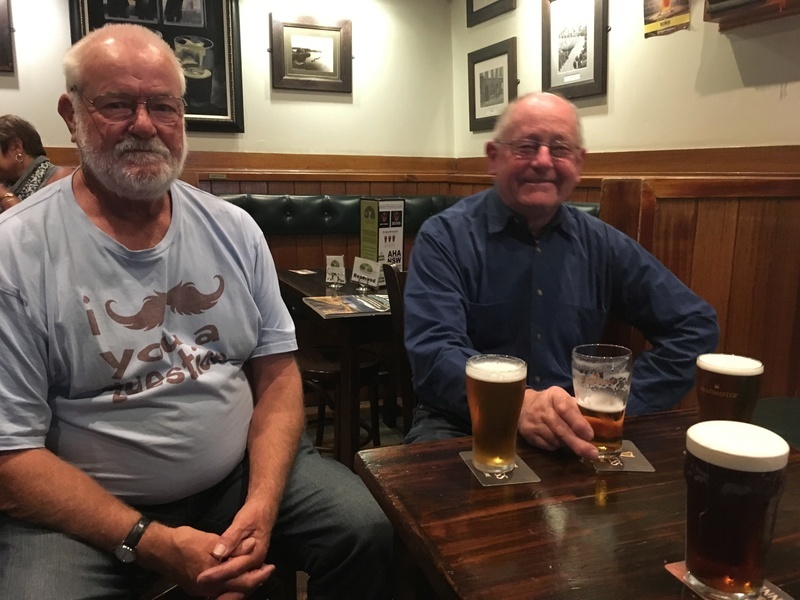 - the warm pub won out and I managed to capture this fine looking pair prior to tucking into that unattended glass of Irish medicine on the table in front of them. My phone rang a bit after 9:00pm (I think) alerting me to the arrival in town of a special guest. 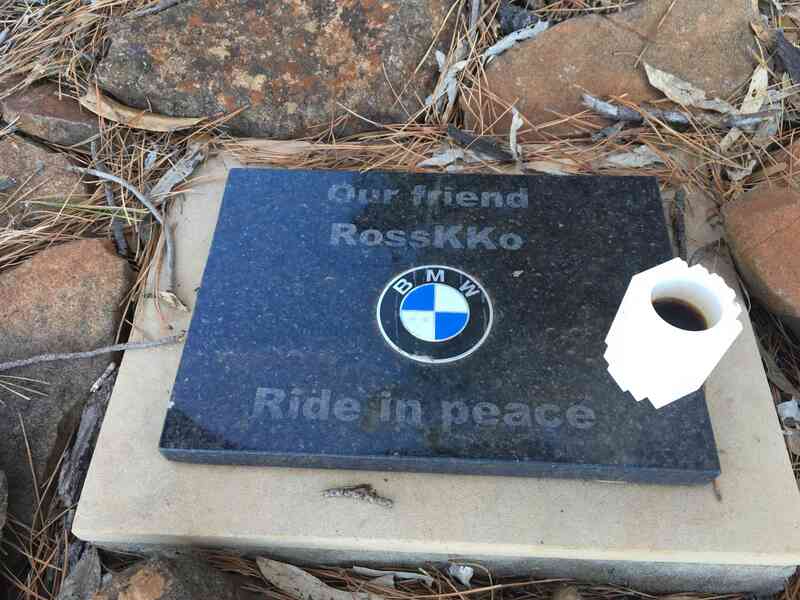 I would like all the readers of this post to think about what sort of a person this guy RossKKo must have been that so many of the members around the world felt so much loss at his passing on this day one year ago AND whose memory motivated this special guest to ride non stop from Brisbane to Bathurst, at my estimate between 900 and 1,000km, to be part of our gathering. Tackler - you're a legend! and luckily we had a spare bunk in the room to warm you up. Others have done a great job of documenting Saturday's activities on the mountain laying the stone in RossKKo's memory here. Thank you to all contributors. A bunch of us then decided to venture west to Eurgowra for a night in a country pub. Ainsjac and Tackler joined Waz, Rickmeister, Tom, Rick G, Smithy and myself for the run over to Orange for lunch after which they headed north for home. Iron man Tackler said he planned to spread the return journey over 1 1/2 days - hope he had a good run. The pub in Eurgowra was mighty hospitable, locking the bikes in the back paved area and giving us free rein with the fire pit. It's a tough life but someone has to do it! This morning in Eurgowra dawned as another beautiful cool clear day. Waz, Rickmeister and Tom headed south to visit RT while Smithy, Rick G and I headed north. 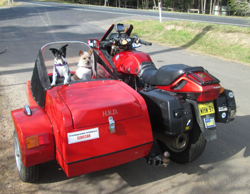 I said my goodbyes to them at Gulgong to ride east into the Hunter Valley and arrived home mid afternoon. They may had encountered some rain further north but I doubt that it would have dampened their spirits after such a wonderful weekend in memory of the best mate any of us could ever wish for. I've just come back from a memorial ride too - "Riders In The Sky", an event in aid of the Somerset and Dorset air ambulance that was set up to remember a local rider Lee Baker, but now a gathering to remember all riders that we have lost along the way. It being just over a year since we lost Rosskko and all but a year since his funeral and my synchonised night time ride to Cheddar Gorge, he was very much in my thoughts during the pre-ride minutes silence. That silence was then shattered by the roar of 347 bikes jostling to get out for the 70 mile ride around the locality ! As might be expected, even with marshals stopping the traffic at junctions, it wasn't possible to keep all bikes together, but we did regroup for an impressive mass ride up through Cheddar Gorge, with the sides of the roads lined by bemused day trippers and the noise of the bikes reverberating off the sheer limestone walls on either side. I doffed my helmet again to Rosskko at the point where I had stopped to remember him on 01 Jun 16. A great turn out, perfect riding weather (18-23 deg C) and a fitting memorial to Rosskko and all those that ride with him in the sky. Can't be sure, but I think I was the only K100 in the pack. Fellow forum members - this Saturday is 26th May which is the second anniversary of the passing of our great friend Rosskko. Tom FKR and myself are heading over to Bathurst for a run up the mountain to the location of the memorial plaque that we laid for the great man last year to spend a few minutes in quite reflection of the positive impact he had on all of us. We are leaving the Branxton Rest Area on the Hunter Expressway at 7:30am and should be up on Mt Panorama in Bathurst around midday if anyone would like to join us. If you are one of the lucky few who has a "brick" shot glass - bring it with you. As happened last weekend, this weekend is also taken up with a high priority commitment. Raise a glass for me while you're there, guys. As with Bill, I also have prior commitments which I can't get out of. 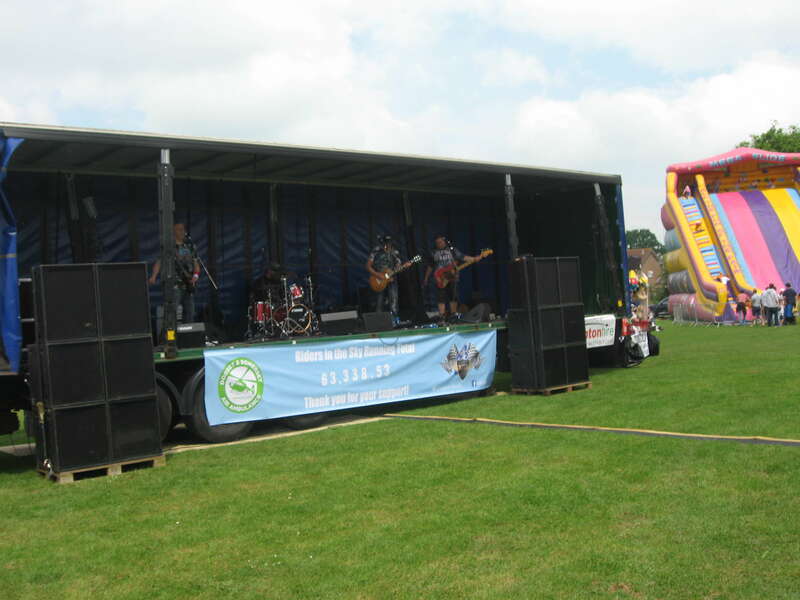 I'll be joining the local "Riders in the Sky" gathering at Glastonbury UK again this year - on Sunday 27 May. A day after your Rosskko memorial gathering. 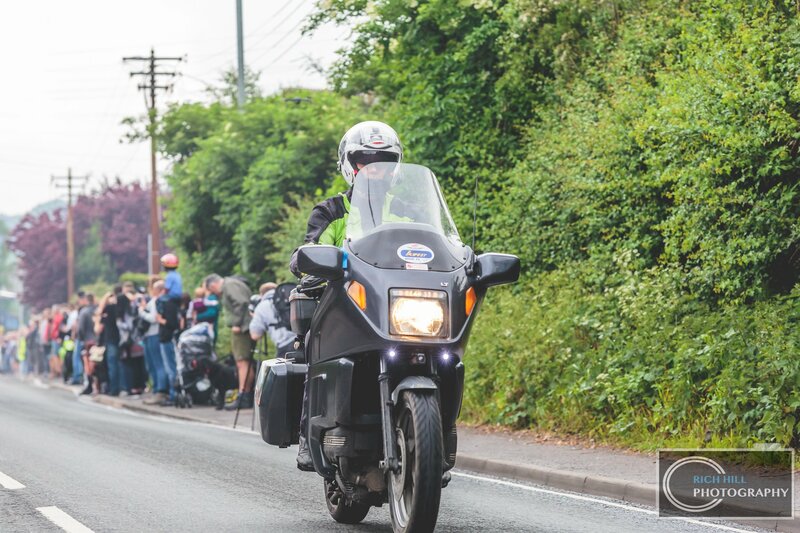 We had 347 bikes last year - if the weather is as good as forecast, we could get even more riders out to thunder up through Cheddar Gorge. My thoughts will be with you all and celebrating the memories of Rosskko. I don't posses Roskko's sense of timing. I will be in Forbes/Orange today giving the RT a run. But have to be home Friday. Safe trip and have a shot for me. be sure to say Hi to RossKKo for those of us who will be absent , in body that is . 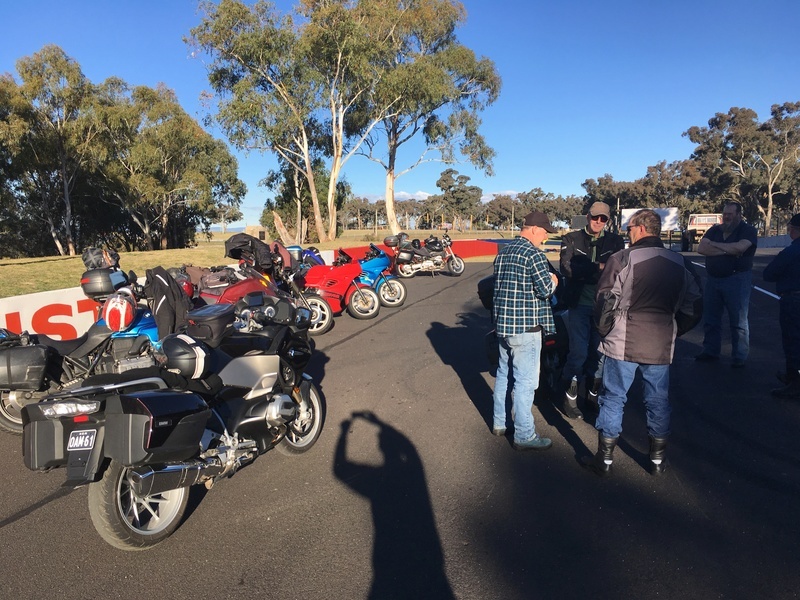 Smurfette and I will be venturing to Grey Gums for the Bikers Biggest Morning Tea , hoping to catch up with a few krew there . Saturday morning, 26 May 2018, dawned cool and slightly overcast as Tom and I left from our usual meeting spot near Branxton at 7:30am headed for our first stop at Bylong for a much anticipated morning coffee. As always it feels good to be away on the bike, after all I hadn't been on a good long ride since the Nindigully run and that was six days ago. Tom wasn't as patient as me and had to have a 500km run during the week with some other riding friends to get him through. By the time we pulled into the store at Bylong for fuel and coffee Tom had over 200km under his wheels and about 150km for me. The overcast sky had cleared and although it was still heated grips temperatures the feel of the sun on our backs was welcome. Once in the saddle again we were in our element enjoying the hills and valleys with their constantly curving roads through the central tablelands via towns like Rylstone, Kandos, Sofala and Wattle Flat. Just before we slowed down for Wattle Flat I had a kangaroo, who should have been sleeping by this time, lunge out of the bush on my right - it was one of those "do I brake or accelerate moments", I accelerated and it passed behind me but as I glanced in the mirror I saw that it lost it's footing on the asphalt and fell over. Tom following was alert and slowed enough to miss it. On arrival in Bathurst we proceeded straight to the top of the Mt Panorama racing circuit to the spot where Rosskko's memorial plaque is mounted and found Waz with Mrs Waz had arrived a little earlier by car since they had decided to have the weekend in Bathurst and had thoughtfully brought their camping stove to ply us with hot coffee. Klompy had also arrived on his K1100 just before Tom and I.
Tom had taken on the responsibility of providing suitable liquor, in the form of Jägermeister as befits Tom's heritage, for our toast to the good times we all shared with Rosskko. We all agreed that Rosskko would have enthusiastically joined in despite his love of the Honey Bourbon. You can see RossKKo's plaque just below the padlock on the fence between us. Somehow that locked fence didn't prevent unknown people from mounting the plaque one year ago and here is the view that the memory of RossKKo enjoys all year round. We all shared lunch together before Klompy, Tom and I rode east over the Blue Mountains via the Bell's Line of Road. Klompy waved goodbye at Kurrajong Heights to head home while we turned north up the Putty Road towards The Grey Gum Cafe where Ed was hard at work organising a large cancer charity fund raising event. We arrived at our destination right on dusk. 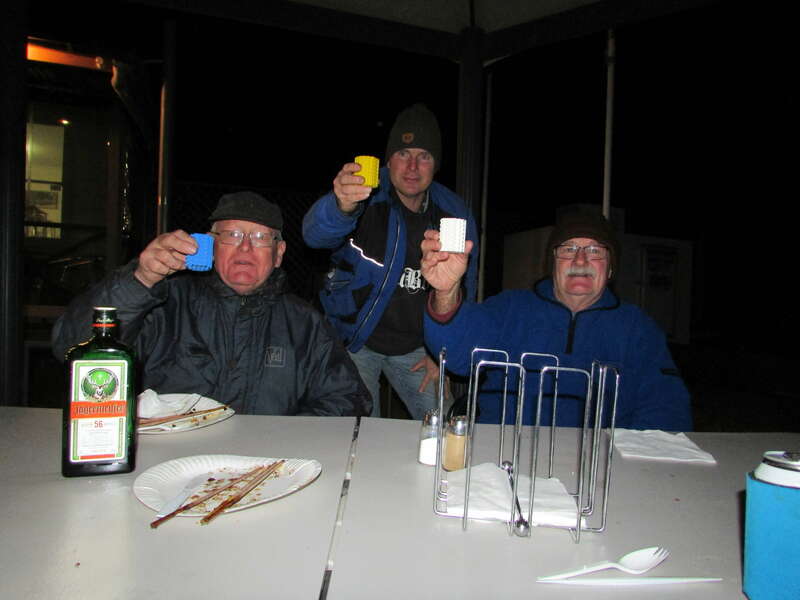 It was already dark and the night chill was setting in by the time we had our tents set up so it was beers by the fire and catch up with Ed and Al-58 and his wife for another round of toasts, in the brick shot glasses, to RossKKo. I'm sure Ed will be along with more photos when he has time. This morning we woke to find ice on the bikes for the first time this year however with a hot coffee and bacon and egg roll on board Tom and I rode off into a brilliant clear day toward home. Around 650km round trip for me and probably 750km for Tom. Our track is on the map below. It's a brilliant spot where RossKo is. It's difficult to imagine Klompy on anything other than that RS. Thanks for the write up Gaz. I have fond memories of RossKKo and the time when we pulled out those brick drinking vessels. Saturday night , found the krew toasting to our mate RossKKo at the Grey Gum Cafe . Another great write up and photos Gaz and good to see the Grey Gums acting as another focal point. My plans for a Rosskko remembrance ride were nearly thwarted. I had been planning on going along to the annual Riders In The Sky (RITS) gathering at Glastonbury on Sunday 27 May 18 with a (non K owning) mate, but got a call from him the night before saying that he had a bike problem and couldn't make it. Turns out it was just a problem with the side stand, but being a sports bike, that was the only stand it had and he didn't have the parts to fix it. Add to that, the forecast was for severe thunderstorms on Sunday and my Saturday evening went from bright to gloomy in an instant. I awoke to torrential rain lashing down. Bugger! I'd been looking forward to this ride for a while, but it wasn't game over quite yet. A quick check of the RITS facebook page and I detected a degree of optimism. A quick check of the weather App on my phone and, indeed, their optimism looked to be well founded, with sunny spells possible later in the morning. What the heck - I was riding a LT, I wear weather proof gear as standard and ride all year around, so optimism won the day over apathy. With a quick fuel stop enroute, I rolled up to the assembly point with plenty of time to spare. The guys at the entrance confirmed that the ride was on, so I parked up, registered and paid my dues (£5) and grabbed a cup of coffee and waited for the pre-ride briefing. Speaking to one of the county council road safety bikers at the event, it seems there have been 4 biker fatalities already this year in Somerset - most of the riders being over 50 which is an interesting, if somewhat uncomfortable statistic for those of us who fall into that that age category. 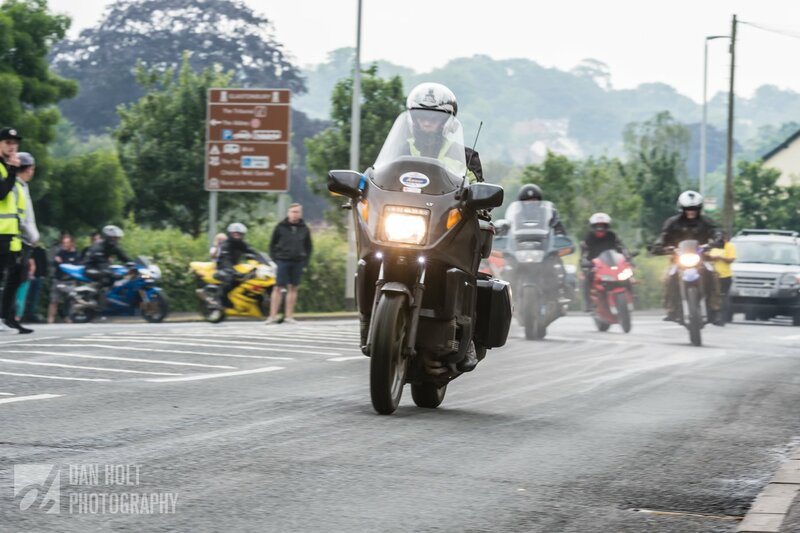 The event was a lot quieter than last year, clearly a lot of (fair weather) riders had been deterred by the forecast and only 195 bikes made it this year, but all things considered, quite a good turnout to support a worthy cause - the Dorset and Somerset Air Ambulance. As with last year, I was the sole K bike in the line up. Gretel got a showing last year, this year it was Heidi's turn (complete with KFest sticker) to show off. We had an enjoyable ride, covering about 70 miles around the highways and byways of Somerset - nothing in comparison with the sort of distances the Aussie Krew put in...but, as I said, I was the only K bike there and to most of the sports bike riders 70 miles was probably a long ride! I started out in the front third of the group, so was able to keep pace with the lead bikes, but was amazed by the number of bikes that kept overtaking and forcing their way towards further to the front. Some of them, clear contenders to become a "Rider in The Sky" sooner rather than later. Each to their own I guess. The weather was kind to us - humid and muggy, but the rain had gone and the roads had dried quickly. With the mist down over the higher ground still, at times were riding in the clouds - like proper riders in the sky! Keeping 195 bikes together is no mean feat but a small army of marshalling bikes did a great job of it. We stopped briefly before Cheddar Gorge to allow the stragglers to catch up and then had the mass ascent up the twisty road through the gorge. I doffed my helmet as I passed the place where I had paid homage to Rosskko on that warm, barmy night at the exact time of his funeral back in 2016. Short video of the ride up through the gorge (and a practice with Picture in Picture to make best use of the front and rear facing cameras). Backing track as per the video of Rosskko's last ride with me and the Krew in April 2016. As the sun broke through, the temperature reached a sticky 24 Deg C and it was good to get to the finish, park up and peel off my heavy jacket. I enjoyed a hotdog washed down with another cup of coffee while sitting on the grass listening to the local band murder a rendition of Iron Maiden's "The Ace of Spades"! 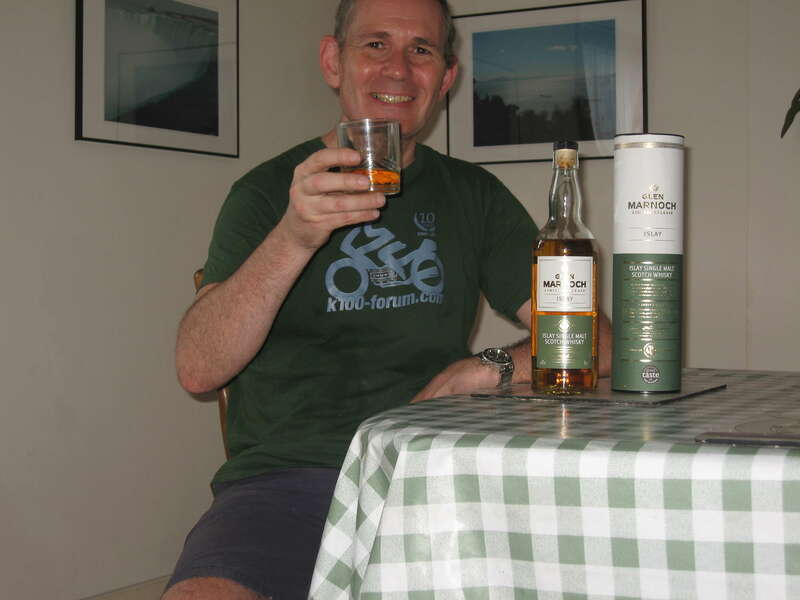 Returning home, via a suitable cross country long-cut, I finally raised a glass of whisky to Rosskko (a cheap (£18), but very drinkable, Islay Single Malt - Glen Marnoch from Aldi!). No doubt it would be way more fun and sociable with a bunch of K bikers, but beggars can't be choosers and it was a good day out and I felt it was a fitting and timely tribute to the memory of Rosskko. "If I were to leave you tomorrow ...... would you still remember me?" That would be a resounding "YES" from the world wide K kommunity. Great video Paul. Would be a great ride on a quiet day with minimum traffic if such a time exists in that part of the UK. The route reminds me a lot of the section of road in the Snowy Mountains between Tom Groggin and Khancoban. 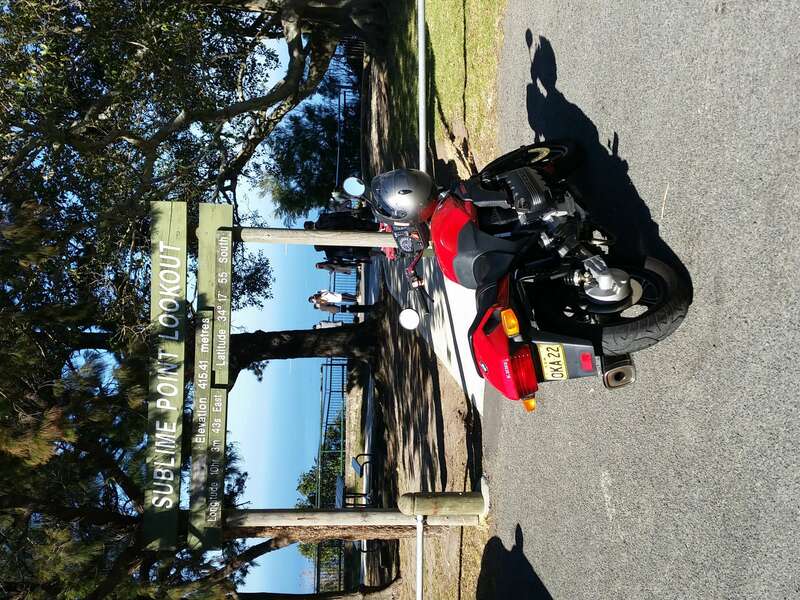 Went for a bit of a "thinking" ride on Saturday morning to the Sublime Point Lookout. @Gaz wrote: "If I were to leave you tomorrow ...... would you still remember me?" Yeah, that line kind of resonated with me when I uploaded the Rosskko's last ride video and it seemed fitting to use the same sound track again...not many of us will be remembered nor deserve to be remembered as Rosskko has been. It's a fairly short but scenic ride up through Cheddar Gorge - and being such a tourist magnet, the road is seldom quiet enough to get a fast run at it. Riding in the company of 194 other bikes was never going to be fast run. Best time is very early on a summer morning - but then you've got to watch out for the goats that come down onto the road. Bit like your kangaroos - but smaller and slower (and a bit less springy)! Today I had the opportunity of going to Sydney to attend a fundraising event for the Life Raft Foundation that supports research into treating "GIST" and assisting families who are affected by this very rare form of cancer that took Rosskko from us. The event was conceived and organised by Rosskko's sister and held at the Gordon Golf Club. The turnout showed once again how our friend was loved and admired it seems by everyone who crossed his path through life. It was great to catch up with his family again and see that they are embracing the future and of course continuing to celebrating his life. Klompy and Richard also made it to the event and we spent a pleasant lunch discussing, of all things, motorcycles of the K variety. 26th of May is a Sunday this year. Gaz advised Mrs Rossko and Rossko's sister may be able to attend this year. It will be good to see anyone who can make it. Don't forget your brick shot glass. I will dig my K bike out for this one. For those previously unable to attend, what does this ride involve? 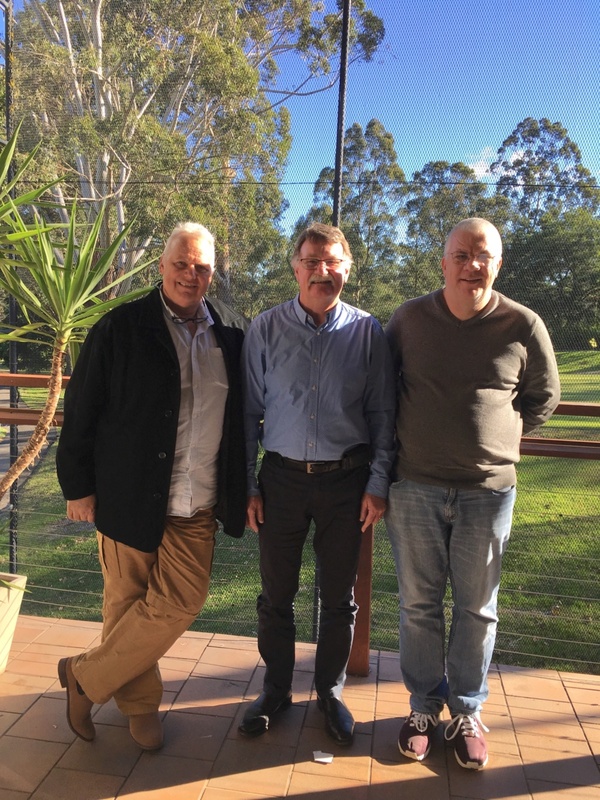 I had a discussion with Rosskko's family at the event in Sydney last year attended by Klompy, Richard and myself regarding the possibility of them joining us and have just opened communication with them again about this year. I will advise members of the outcome. 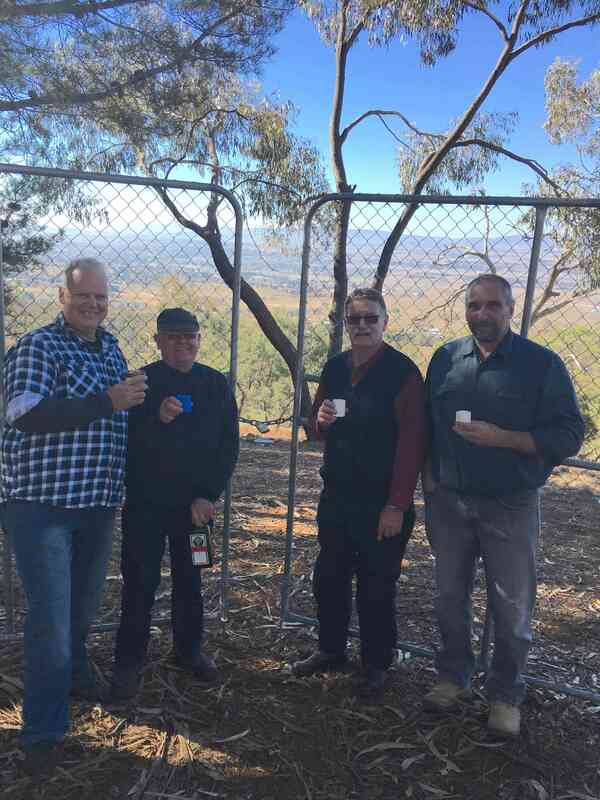 Sean, my memory is fading with the advancing years but I think we gathered last year up on Skyline at the race track at Mt Panorama just before lunch to raise a glass to our departed friend and then went and had lunch together down in town. Others who were there please correct me. Anyway with the possibility of members coming from various directions I'm sure we will arrange a mutually convenient time and place via the forum for our get together and eventually find our way up to the spot where Rosskko's memorial stone is placed. Gaz, I didn't make it last year, but I was there for the laying of the the stone the year before. You are correct with the outline of events. Sorry , I'm out for this one . However my thoughts will be with everyone and Rosskko on the day . Certainly raise my cup ( brick glass) in memory. I will once again be hosting the Bikers Biggest Morning Tea at the Grey Gum Cafe , on the Putty Rd . @Waz wrote: 26th of May is a Sunday this year... Don't forget your brick shot glass. 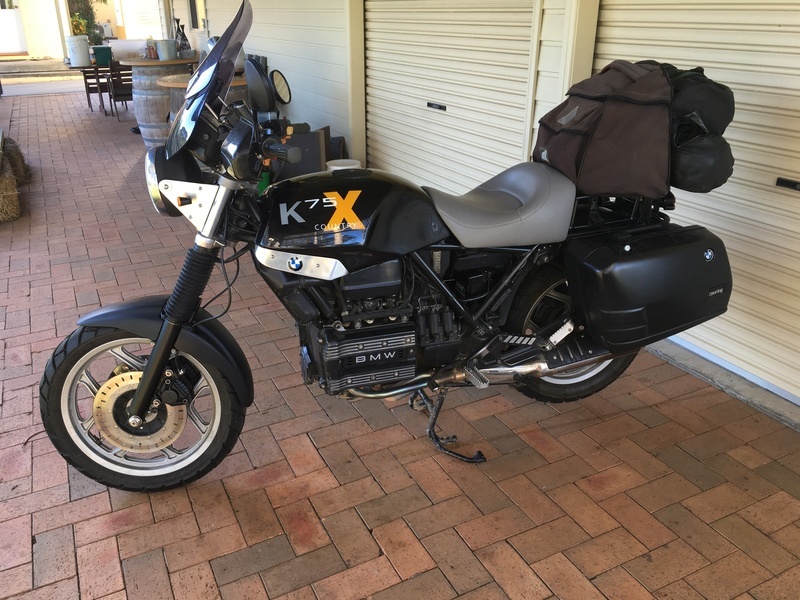 I will be out and about on my K100 on that day, but a long way north of the Sydney fringes. Sun 26 May will find me recovering from an epic open day of whisky tastings (part of the annual Islay Feis on 25 May) at the Lagavulin distillery on the Scottish Island of Islay and taking the ferry across to the Mull of Kintyre and thence onward, the long way around, to the ferry and the Isle of Arran for a spin around that imposing rock. I'll have my Northern Tableland 2018 brick shot glass with me on my tour and will raise a toast to Rosskko and the rest of you from afar. Photographic proof assured! Weather not assured!! The vague plan I'm hatching at the moment is to ride down the day before via Breeza, Spring Ridge, Coolah and Gulgong and throw a tent up at Sofala, then next morning riding in from Sofala at the appropriate time, depending on what's organised etc. Home again via Bylong, with a possible overnight stop at Rylestone to throw a tent up..once again depending on what transpires at Bathurst. Company on the trip more than welcome. @Born Again Eccentric wrote: the Isle of Arran for a spin around that imposing rock. Keep off the Glen Rosa road, if you want to keep your suspension intact. I can highly recommend a slow run along The String - best way to do the island IMO is as a figure of eight and ride The String twice. Sean, the Hunter Krew almost always go through Sofala on the way to Bathurst so that will work out well. We'll naturally keep you all posted on what plans are hatched. I will have my brick cup with me , and shall toast Rosskko on saturday evening whilst round the campfire . 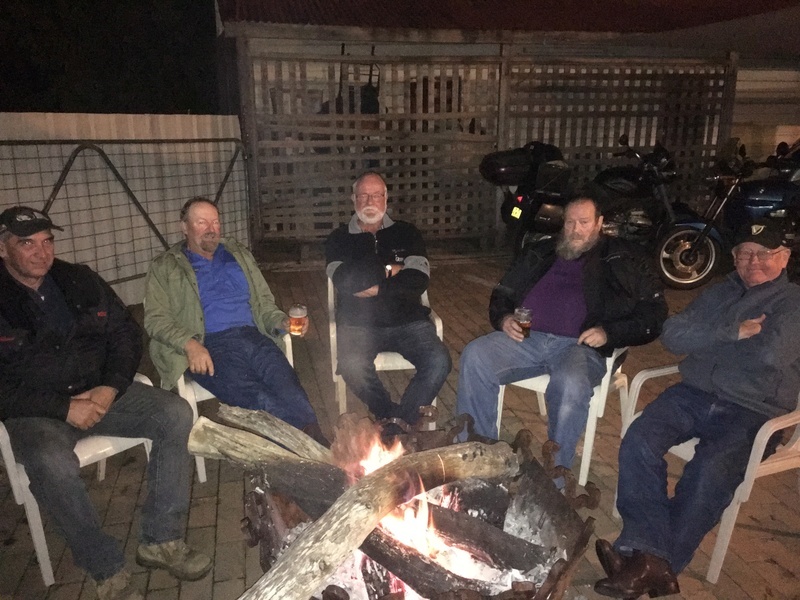 @Saxon7 wrote: The vague plan I'm hatching at the moment is to ride down the day before via Breeza, Spring Ridge, Coolah and Gulgong and throw a tent up at Sofala, then next morning riding in from Sofala at the appropriate time, depending on what's organised etc. Home again via Bylong, with a possible overnight stop at Rylestone to throw a tent up..once again depending on what transpires at Bathurst. Sounds like a good plan Sean, I'll try to add it to the calendar. Cheers Dai - a figure 8 pretty much sums up how I'll be riding Arran, but thanks for the suspension warning. I'll be reasonably well loaded with camping gear (hopefully finding somewhere to wild camp off The String), so whilst I'll be riding some of the roads less ridden, I'm not looking to ride the roads less tarmac'd. Yes, that's true if I remember rightly. No tucker at the pub and nothing else in town... I would probably have campfire food. 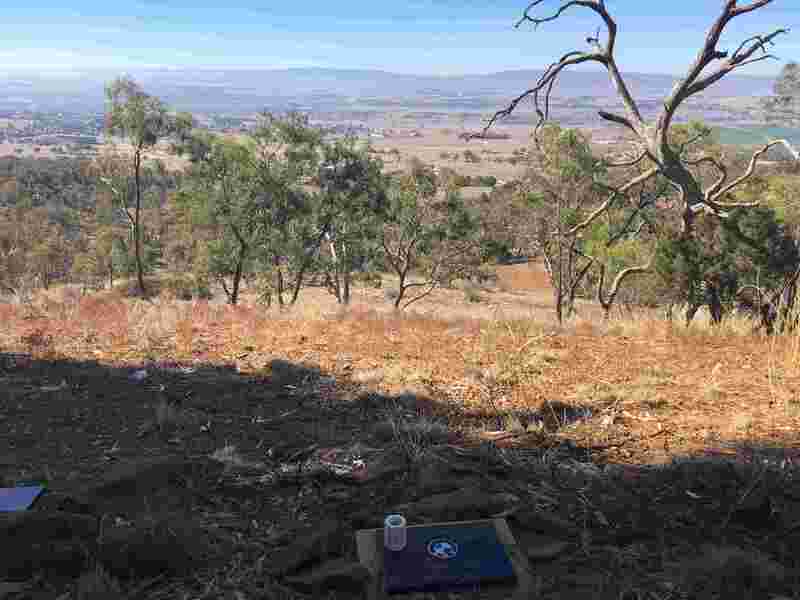 On the other hand... at the end of May the camping will be quite fresh there... maybe a pub in Blayney or somewhere might be on the cards... will give it some thought. Camping next to the pub at O'Connell (sidecar rally site)? Or there's a great looking site on the Fish River on Mutton Falls rd about 5 mins ride from the pub. nothing wrong with campfire food ....!! now have a good cooker as well ...bonus !! We can take our own tucker and I'll supply some Fireball or Jaegermeister in case it gets chilly. I'd rather camp there than at O'Connell. The next time I see Sean Kelly I'll probably get myself arrested. I have had a reply from Mrs Rosskko thanking us for thinking of them and some of the family members are keen to make the trip this year. Initial indication is that they will stay overnight in Bathurst on Saturday. I will stay in touch with them as we zero in on the date and plans come together.